I'm turning this post over to my knitting girl, Sunshine. 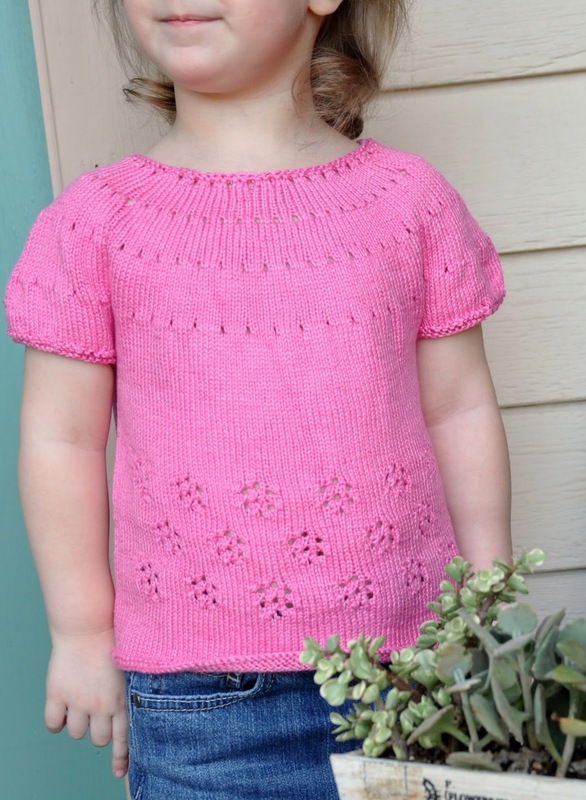 She has been working as a test knitter for Katherine, testing out this adorable Blossom Tee pattern. It is beloved by her littlest sister and just about everyone else who sees it including costume designers for television shows (more about that later). There were many adults at a family party yesterday wanting one in their size! 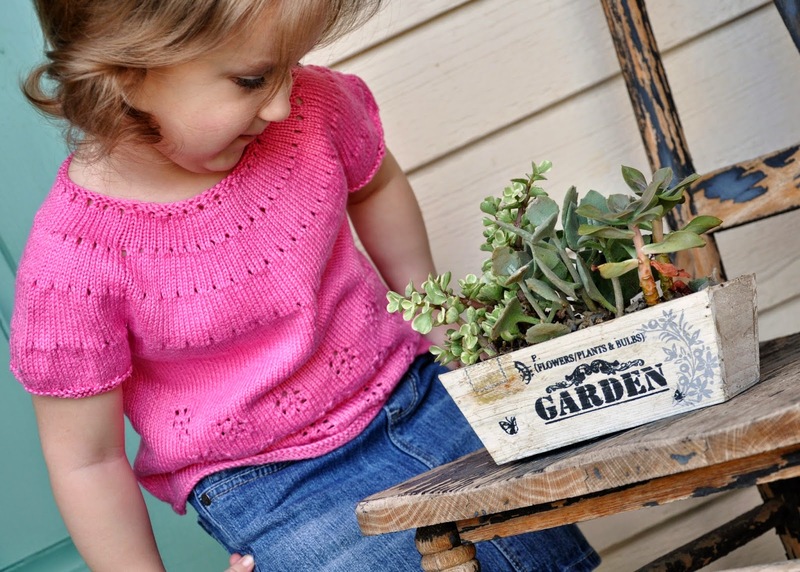 Katherine is offering a giveaway on her blog for the pattern if you are a knitter or know someone who is. 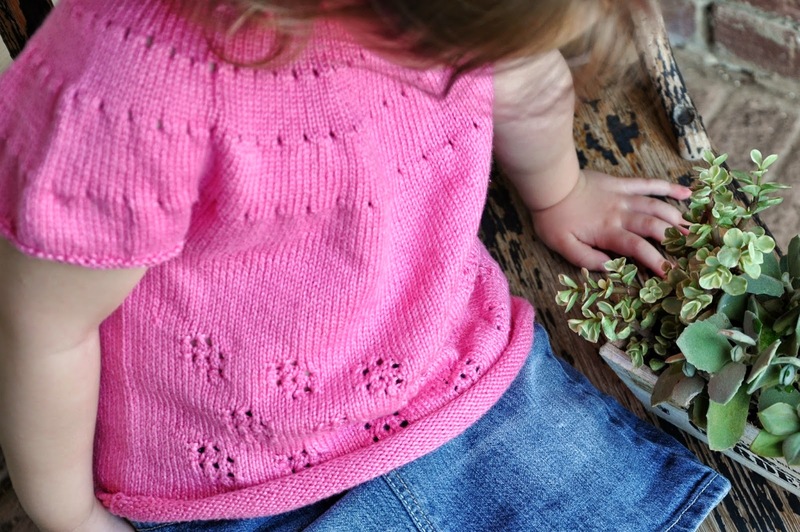 I had been knitting for a little over six years when Miss Katherine asked me to test knit the Blossom Tee pattern for her. 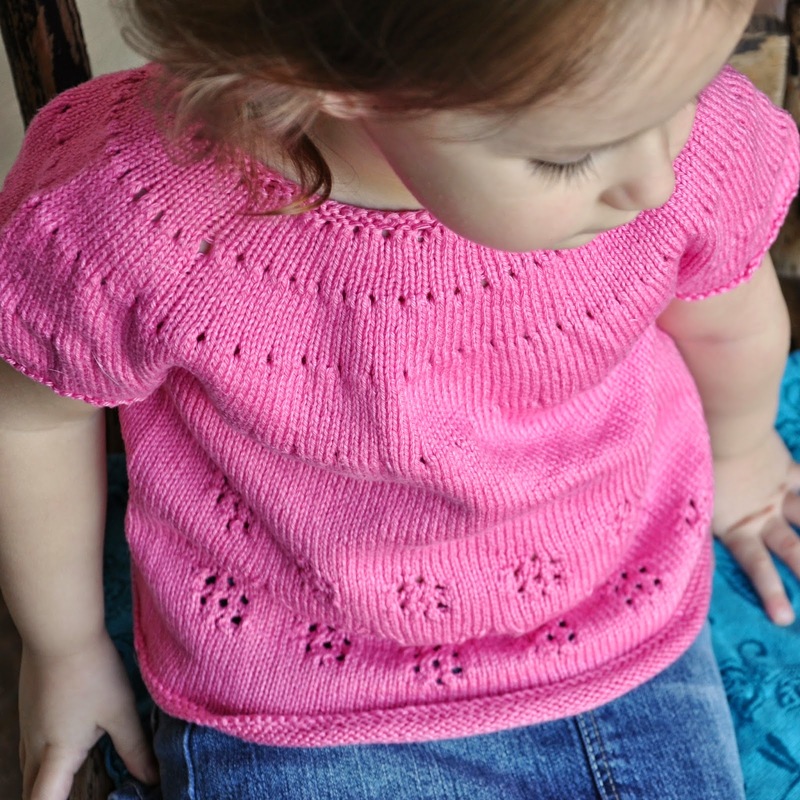 I had knit one of her other patterns before, the Martinmas Sweater, and I was thrilled to test this one as well. 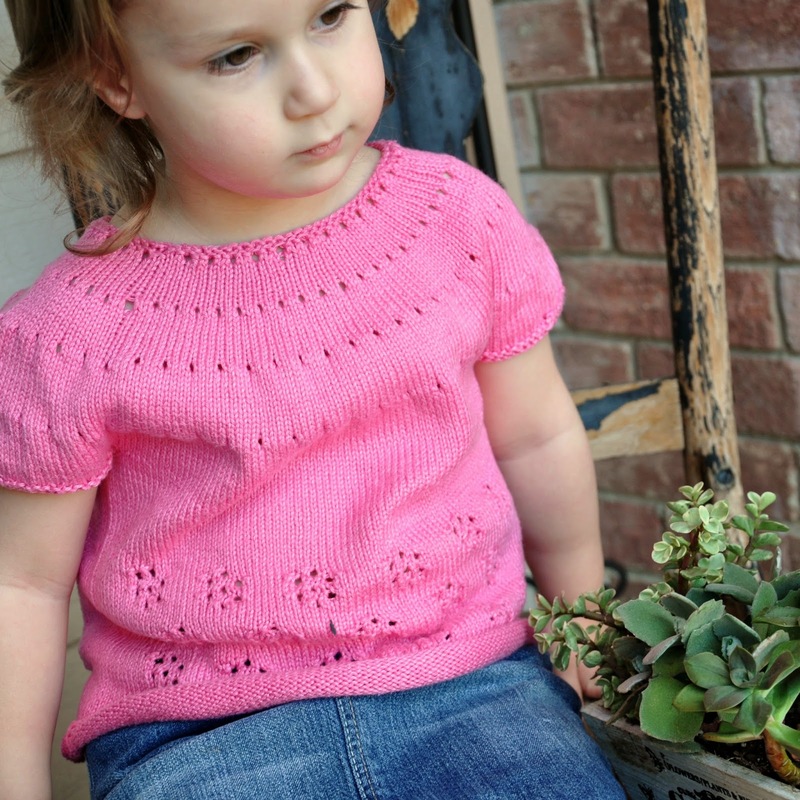 I tested size 4 in Cascade Yarn's Ultra Pima Fine in Primrose for my little sister, Cupcake. The pattern itself is very clear and precise, perfect for a beginner knitter who is ready to move on from scarves and such to their first sweater. The yoke increases and the flower detail at the bottom of the sweater also introduce the knitter to very basic lacework. Very simple, yet at the same time, pleasingly challenging. It did take longer than I would have guessed to knit this sweater, but only because of my gauge. I cannot stress enough how important it is that every knitter knows how to check their gauge before knitting on a project they want to turn out well. A friend of mine commented on gauge once, “Gauge: the bane of a knitter’s existence that miraculously saves sweaters from turning into tents,” and I whole-heartedly agree. It is crucial to check your gauge before, and even during, your project, because your tension might not stay consistent throughout your work. Checking your gauge will keep your tension in check and prevent you ending up with a garment that’s too big or too small. (Need I tell you about my first sweater that was much too wide in the middle with the sleeves hanging way past my wrists? I thought not. :) So, it took me longer to finish this project because I had to start over and pay closer attention to my gauge throughout, but it was worth it to get it right.